An innovative project at the University of Cambridge will uncover some of the hidden histories of illuminated manuscripts, thanks to the application of techniques more commonly found in scientific laboratories. The MINIARE project will help conservators repair priceless works of art and provide new insights into the cultural, social and economic circumstances of their production. And, crucially for objects of such rarity and fragility, none of the techniques involves touching the manuscripts or removing samples. 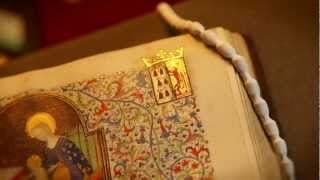 Led by Dr Stella Panayotova, Keeper of Manuscripts and Printed Books at the Fitzwilliam Museum, and Professor Stephen Elliott, from the Department of Chemistry, the MINIARE project is using scientific techniques to identify the composition of illuminations. The research will help conservators repair priceless works of art and provide new insights into the cultural, social and economic circumstances of their production. And, crucially for objects of such rarity and fragility, none of the techniques involves touching the manuscripts or removing samples. Scientific analysis of the pigments can provide valuable contextual information, as research scientist Dr Paola Ricciardi is discovering. Using analytical techniques such as fibre optic reflectance spectroscopy and X-ray fluorescence, as well as visual imaging techniques such as microscopic observation and infrared reflectography, she is identifying the composition of pigments as well as revealling underdrawings and preparatory sketches. The goal is to expand the current project, which has been funded by the Isaac Newton Trust and a private sponsor, to encompass not only the 2,000 manuscripts held by the Fitzwilliam Museum, but also those held by the University Library and Cambridge Colleges, and the team is actively seeking new funding to do this.